The Seattle City Council is setting an important agenda on the City’s upcoming budget. There’s a lot of important issues that Council will sink their teeth into ranging from Criminal Justice to Arts and Culture funding and public library wifi hotspots to the Central Waterfront Project. But one big item in the budget is Pronto expansion. Mayor Ed Murray has proposed $5 million in funding that could leverage millions of dollars in other grants. Together, the city’s bike share program could grow to 250 stations and 2,500 bikes — up from 54 stations and 500 bikes. For Seattle residents, that means more service to more places. In fact, well over 60% of Seattleites could be within walking distance. And it gets better. The Mayor’s proposal includes the addition of electric assist bikes, which helps those with less ability have access and makes hills less of a climb. But more than that, this plan is about equity, sustainability, and affordability. 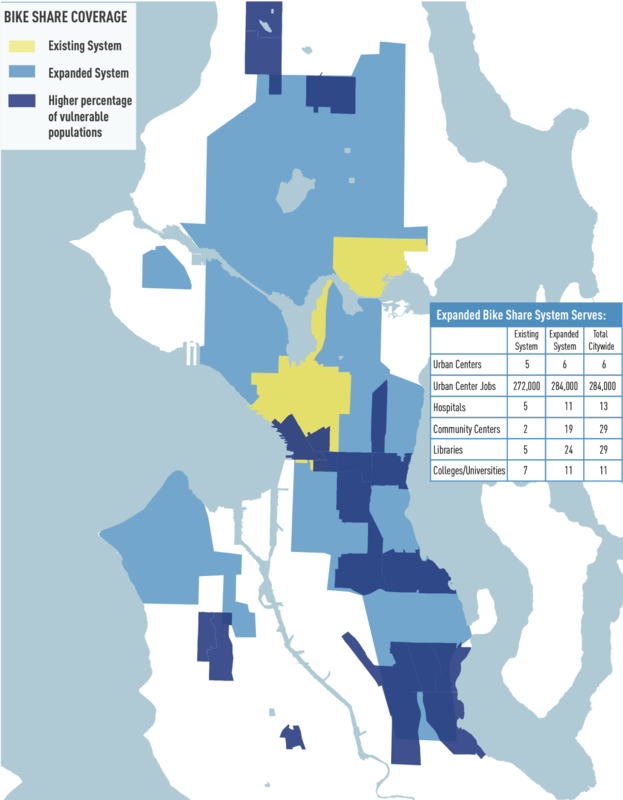 The Mayor’s proposal will greatly expand bike share into deeply underserved neighborhoods, particularly in Southeast Seattle and North Seattle. Those who use the program could see immense transportation cost savings. For the cost of $85, members effectively get unlimited use of the bikes throughout the year. And data from comparable bike share programs show that the average user saves between $750 and $850 in annual transportation costs. Perhaps best of all, bike share is leaps and bounds more environmentally sustainable than any other wheeled mode. If you’re a Pronto member or believe in bike share, take action to let the City Council know that you want bike share to be a priority in this budget. The Council will meet tonight in the City Hall Council Chambers at 5.30pm for a public hearing. You can provide testimony on this or any other budget topics. Alternatively, you can contact Council directly at council@seattle.gov. I live at [INSERT ADDRESS], and I ride Pronto. It’s a great service that gives me more choices for getting around Seattle. However, it would be far more useful to me and thousands of other Seattleites if the service were expanded and covered additional neighborhoods. It would offer me, and others like me, another option to get where I need to go or connect to the bus and light rail. Right now, the City has the opportunity to allocate $5 million to help expand Pronto, just 1% of SDOT’s budget request this year. This relatively small amount of funding would allow thousands more people to take advantage of this affordable and healthy form of transportation and help minimize congestion on our streets. That’s why I hope you will support this important piece of Seattle’s budget.